Part of the Greater Austin area, Caldwell County is home to more than 38,000 residents (as of the 2010 census). 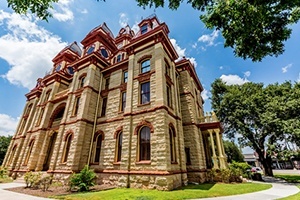 The county traces its history to 1838, and takes its name from Captain Mathew Caldwell, a ranger who took part in the Battle of Plum Creek and Texas Revolution. The Lyttle Law Firm has represented countless cases Caldwell and the rest of Greater Austin area, helping residents resolve their family law matters. Our many years of experience have taught us that matters involving conflict in families are rarely free of complexities. These are almost always emotionally charged situations, which is why going without legal representation or advice can compromise any chance of a positive outcome. Furthermore, it may ruin your finances. Divorce – We offer strategy consulting to divorcing spouses to ensure as smooth a separation as possible from their partners, determining the best recourse for custody, asset division, and alimony among others. Child Custody – Attorney Daniella Lyttle will see to it that your child’s rights and wellbeing are the primary concerns in your child custody case. Father’s Rights – We can help fathers who may feel that they are not getting a fair deal during child custody cases. The Lyttle Law Firm can help sure your paternal rights are protected. Annulment – Ms. Lyttle may also recommend annulment as a more viable option for dissolving your marriage. This is usually the best option for spouses who want to erase all record of their marriage. Mediation – Divorce proceedings need not be confrontational. The Lyttle Law Firm can use mediation as a way to smoothly resolve any issues between you and your ex-spouse’s lawyer before dissolving the marriage. Property Division – Dividing assets is often one of the most contentious aspects of any divorce, especially when one spouse has more properties and assets than the other. We can help negotiate the best possible solution for dividing property acquired during your marriage. Spousal Maintenance – The Lyttle Law Firm can help resolve common issues in spousal maintenance claims, including the amount and duration of alimony provided by one spouse to the other. Prenuptial Agreement – Although “prenup” agreements have a pejorative aspect, they are a common-sense solution to ensure your interests and properties are protected should the worst-case scenario happen. There is rarely anything easy or smooth about most family cases. In fact, the smallest mistakes can have deep repercussions on your relationships and financial health, having a negative effect on your quality of life. Let Daniella Lyttle of the Lyttle Law Firm represent your case and ensure you get the best possible outcome. Contact our legal team for experienced family law representation in Caldwell County, as well as Hays, Bastrop, Travis, and Williamson Counties. Call our offices today at (512) 215-5225, or use our contact form to schedule an appointment.